This work of speculative fiction explores a topic humans have wondered about for millennia: the afterlife. W. B. Ross’ vision of what happens after a person dies is both unique and wildly thought provoking. The story is set in a near-future where, 60 years earlier, a monumental event occurred in Chickasha, Oklahoma: The heavens opened and a procession of saints and angels manifested themselves on Earth and travelled to a small church. The plot largely revolves around Beatrice, a girl with stunning violet eyes whose mother was a member of the original congregation. 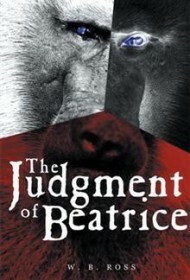 After her mother died, an unloving father cared for her; he deemed Beatrice crazy because she believed she could communicate with three sentient baboons no one else could see. Beatrice learned to keep the existence of the baboons to herself and lived a good life. But at 60, while her grandson was over for a sleepover, she died in her sleep from a massive heart attack. The afterlife, it turns out, isn’t all about eternal rest. Beatrice meets her spiritual sisters and is thrust into an epic battle between good and evil that centers on the soul of her grandson. When all is said and done, the afterlife will never be the same. The author includes a fun and interesting wrinkle in the storyline by adding editorial comment in the names of characters and places, found when the name is read backwards. For example, Beatrice’s last name is Dellac (called), a church is Saint Daelsim (mislead), and an airport is Dednuorg (grounded). The narrative is seamless and briskly paced, with the exception of multiple tangents involving the judgment of the souls of historical figures (Dracula, Jim Jones, etc.) that detract from its momentum and dilute the profundity of Beatrice’s story. That said, this remains a powerful novel that explores a powerful topic. Regardless of readers’ religious belief systems, the story will surely compel them to re-evaluate their take on the afterlife.